Grant is taking Monday morning quarterbacking and second guessing to a new level. KS will start putting his nonsense up in the locker room to motivate the guys. They just need to get into the playoffs which is doable and be peaking down the stretch. That’ll shut him up (hopefully). I’m sure if the 49ers win the SB this year Grant would find fault in something. When you think you are smarter then the head coach you will never admit you were wrong. He never does that. Son like father. They never say anything good about thec49ers. Brown could pass block, not good in our running game. With Jimmy’s quick release, McG’s overblown “weakness” in pass protection will be mitigated. McG improves the running game which will improve our play action passing and the passing game in general. That is an upgrade. Brown had to be moved when he showed up out of shape. Please. He just got hosed in the Garoppolo deal. Recall Grant ripping Aaron Lynch for weight issues (a pretty decent pass rusher when in shape and focused). Yet, Grant sings the virtues of an out-of-shape tackle. Grant wants and gets to eat cake. Both Tartt and James can play either safety spot. The Pats run outside zone, too. Belichick didn’t want to make the Garoppolo deal. Kraft made him. Kraft made him trade Chandler Jones too? Also, the Kony Ealy trade was a resounding success for them too. First off, you said that TB doesn’t fit this offense and the only reason he was still on the team was because of his pass blocking skills. However, his run blocking skills were less than ideal. KS puts a higher premium on run blocking skills. Like it or not, Mcglinchy is a better scheme fit. Plus one element you’re forgetting is that Moore was drafted with an eye towards CB, but I believe his ceiling is higher as a safety. If Moore tries out for CB, he won’t make the cut because it’s crowded wither Sherman, Witherspoon, Ward, McFadden, and all the Idea’s. His chances of making the active roster are greater if he tries out as Safety . ‘Please. He got hosed in the Garoppolo deal’. If McGlinchey can play at the same level as Brown the 49ers win the trade for their needs because he’ll be on a rookie deal for the following 4 years. Two sub par, even possibly bad, drafts in two seasons. Last year felt like it was Lynch’s draft. The reach for his alma mater buddy had his finger prints all over it. This year felt more like Lil Shanny’s doing. Neither knows how to draft. They both make it personal. Is there any objectivity in their selections? They draft like school kids picking teams on the playground, grabbing friends rather then actually looking if they’re making a good team. So, what’s next? Are Lynch and Shanahan so flawed that all is lost? Is there any hope? Seriously. Any names for the next GM and HC? Jed is likely to ride this lame horse, what, another 2-3 years? “They draft like school kids picking teams on the playground, grabbing friends rather then actually looking if they’re making a good team.” Okay. If you say so. I’m confident if, and I say if, the 9ers finish above .500 in ’18, those on this board who feel we’ve severely botched the last two drafts will acknowledge that some progress has been made. If… If not, bring your pitchfork! The offense made a huge leap of progress when they were gifted JG. I like the McGlinchey pick because I think he could be an eventual replacement for Staley and a starting LT is well worth the draft spot used on him. Also, I like Brown but am not nearly as high on him as our esteemed host. You could try and make the suggestion that we sold low or you could also consider that the player wasn’t really big with the current regime and since the Patriots didn’t have to give up much it was an easy trade for both sides. We’re gonna have to see what this defense looks like if Foster is unavailable and they haven’t miraculously developed a decent pass rusher. I don’t have a lot of high hopes for it at the moment. They haven’t addressed their secondary in any meaningful way, they continue to make picks to positions that have no pressing need and with players that are far from BPA. .500 might not be that hard to achieve with this team but you might have to get used to that number for awhile. I hear ya. This will be a fascinating year. Would be fun to learn what the position coaches are thinking. I hope Jimmy can at least make it interesting to watch. That, and having an energized Saleh return with a year under his belt. The Rams are stocking up in ways fans find exhilarating, yet I’m thinking the Rams could be a bit brittle the last half of the season–lots of egos, attitudes, and over-the-top expectations. Some teams can’t handle that. Some. Yep, there’s gonna be some friction in that Rams locker room, and they loaded for this year, not the future. Love the direction the Niners are going. They got ripped, still getting ripped, for last year’s draft and I can’t see anything wrong with the results. Saying Belichick wins and not noticing all the cookie cutter Smurfs he uses is just weird. He wins because he plans for attrition. Grant, why such linear thinking? This article really sounds like sour grapes, which is hard to understand from someone who claims neutrality. And Ballard’s a genius. We’re in much better shape than Indy. Leonard over Warner was a complete and utter whiff. The only bigger reach was probably the one the Saints paid for the privilege of earning that honor, and that was Davenport…. Says some guy on the Internet who didn’t get his way. Just like the clown who wrote this. 2004 NFL Draft — 49ers got A’s and A-s for that. Except for Andy Lee the punter, it was a failure. The closest thing we got to value after Lee was Sopoaga and Smiley and they were poor players their whole careers. 2012 — Baalke’s first disaster draft. Solid Bs except for Sports Illustrated the only one to get it right with a D.
Grades for fools. Fools who think too much of themselves and really, don’t have a clue, which is why they’re in comments section telling everyone how ‘great’ or ‘bad’ the draft was before they go to work at their 8-to-5 drone job. I panned the 2012 draft immediately. Now, go to work. Even if we had somehow been able to pick the top 10 players in the draft we would still be a couple of years away from winning big because they would need to get acclimated to Shanahan’/Selah’ philosophy and the speed of the NFL. I think back to NFL expansion teams that were allowed to pick high-end players and still fell flat on their face during the season. It’s evident that Lynch and Shanahan see the draft much differently then we do, but it doesn’t mean that they don’t know what the heck their doing. I’m going to trust their 3-4 year plan to build a perennial winner. The foundational pieces are being set for this to take place. For now I’m good with their picks and UDFA’s. Remember all we need is 1 more win then last year to show improvement. For me, 8-8 would be considered very good and trending up. That would be Taylor. But he was drafted to play X in the future. You want to talk about what we didn’t do. What we did do was add two important pieces to the offense. So Shanny favored offense early. What did you expect? I expect any Shanny coached team to be better on offense than defense. Pettis won’t have to beat anyone out, except journeymen-of-the-future like Kendrick Bourne. Pettis will be next man when up when any of the veterans inevitably get injured. And given how crisply he runs routes, with an accurate Garoppolo slinging the ball, there’s an outside chance he earns a starting job before the end of the season. 1. Drafting McGlinchey confirmed that the Niners had had enough of a fat, unmotivated player whose agent was about to attempt highway robbery at the end of this season. McGlinchey is TB’s polar opposite in terms of attitude, passion for the game, smarts, leadership, and self-discipline. In short, they replaced a loser with a winner. 2. Grant’s right that the Niners should have used their first pick on an outstanding safety, but he’s one year off. Instead of drafting Solomon Thomas, who may never amount to much on the team, they should have gotten Jamal Adams, who’d have been a leader and enforcer on the defense for the next decade. If Reuben Foster goes to prison and never plays again, it will be as if the Niners had no first round pick in the 2017 draft. Oh no! Caught Grant with his own words! Grant is a man of curious contradictions… He’d make a great Air Traffic Controller. “United 337 heavy, descend and maintain flight level 31,000.” Seconds later… “United 337 heavy, I told you to maintain flight level 36,000!!!!!!! Makes me wonder if he really believes everything he puts in his hit pieces. It’s a Grant ‘drive-by’. Hope Grant nails Lynch and Shanahan at the next round of pressers. Hard. I still believe he must be paid by the number of “clicks” and not by the actual articles. I can’t change my mind? One day all roses (with certainty! ), the next day filth and despair (with certainty)…. I guess. A total 180 is kind of odd though. It if makes you feel better, Reed has 31 5/8 arms. Not bad for his size. Williams needs the competition. Reed was a great pick for where they got him. He’s got a legit shot at becoming the starter by next year…. Potential ballhawk. And he could compete with Kray for team DJ. Choose your words carefully, you may have to eat them. We know that. In your eyes you know it all. So you think Grant. Just having fun…I’m not predicting MM gets his HOF blazer….but how sweet it would be. Don’t forget, MM fell into Grant’s Pro Bowler club. The rams can’t keep that team intact. They will have cap issues within 2 years not being able to resign players. Perhaps these picks that are reminiscent of baalke tell a deeper story. Maybe Baalke didn’t have last say in the draft selections and it is actually Parag making the final decisions. That being said I don’t give much credence to the sky is falling motive when it comes to facing these passed on rookies in the season. Rookie running backs are notorious for fumbling. Rookie CBS are over aggressive and can be exploited. Paraag is the money man, he has no say in player decisions. Thankfully, they held off until the 4th round before the Paraag analytics ACL pick was imposed on the draft team. They drafted 3 players with major injury concerns at positions that were not really needs in one draft… that’s right up there with Baalke. Matt, Matt, Matt. That’s just silly my friend. With all of the scouts and Player personnel execs a confident GM and Coaching Staff, no way, no how are they going to let a money manager make roster decisions dude! Bag man for Foster is a more plausible conspiracy theory!! Just because Baalke Head didn’t get his all ACL team right, doesn’t make it a total ineffective strategy. Teams have been using this tactic for years and have had success with it, see Mcgahee Willis, Myles Jack, and even though I wouldn’t have used an early second rounder on Jaylon smith, it appears as though he may be coming around as well, there are a lot more success stories here, but you get the picture. Why is the smartest football mind in the world writing about the game and not a coach or GM? Inquiring minds would love to know! See Trent Baalke and Matt Millen. Apparently we can’t disagree and should blindly follow Baaaaaa. April 29 2019 — A year from today. Let’s agree to circle back and check all the assertions (pro and con) made about the last two drafts. If I’m still alive, I’ll bring the topic forward. Could be difficult because we’ll be ripping Lynch and Shanahan yet again over another horribly botched draft. Anyway, I’ll give it a go. Mike “Drago” McGlinchey is already smarter, stronger work ethic, and a better run blocker than Brown. Play action is a little more effective when you can actually run the football. Will he be as good in pass pro as Brown? Dunno, but I wouldn’t bet against him. Pettis was being spied. Did they get a little froggy? Maybe, maybe not. They like versatility, and Pettis can play all 3 positions, as well as punt return. Short fields for Jimmy spells doom for defenses. Someone’s gonna get hurt. Happens every year. Happened last year. Did you know this offense is difficult to learn? Gotta be smart. 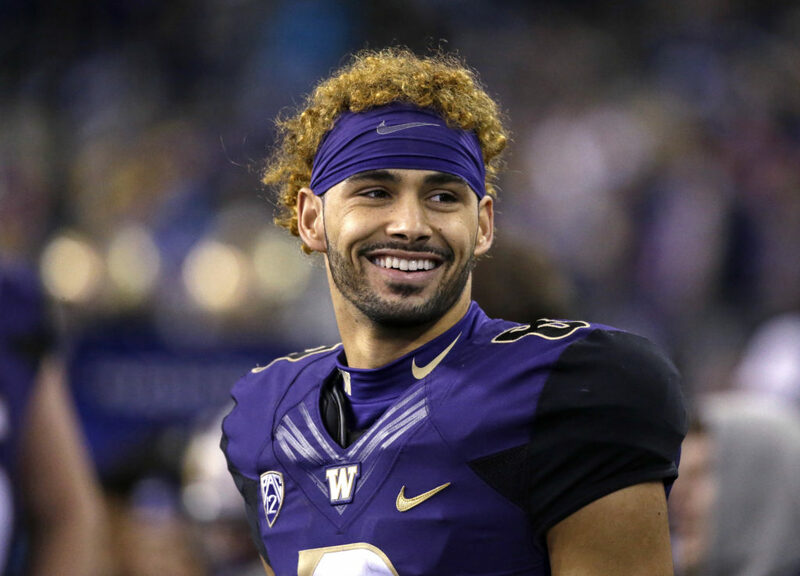 Guess what Pettis’ Wonderlic was…32. Drago? 37. Warner? 32. Noticing a theme here? I knew you’d catch on. Moore(4.3) is fast, and plays fast on tape. He’s got a legit chance to play corner, but I’d like him at FS. Jackson(4.6) isn’t fast. Oliver(4.5) isn’t either. They weren’t going to draft 4.5 guys until day 3 at cornerback. Street wasn’t taken until day 3, which is when you roll the dice on those players that may allow you to move on from Armstead in 2019 and save yourself money. How much you wanna bet they don’t pick up his option? James is a separator and I figured Shanny would like him. He replaces Bolden. Not sure what the infatuation is with height, but clearly this regime does not put a premium on it. They like speed and separation. If he happens to be tall too, he’s probably Julio Jones…. I would have preferred James or Edmunds. I was hoping the 49ers took a corner in round 2. The trade up in round two seemed an act of desperation. 59+74 should have garnered Washington’s 44+109 (only 6 chart points difference). And I’m not happy about the hurt guys. But I’m not grading the draft. If the players perform as hoped, great. Lynchahan goes on “does this guy do what helps in our system?” more than generic talent. McGlinchey will improve run blocking. I really thnk Pettis pairs well with Garoppolo. Warner’s film looks great. And if you haven’t seen Jullian Taylor’s highlights, look them up. Its a treat. I’m excited to see how Moore pans out at corner. The run game got better this offseason. Multiple slot type receivers on the field at the same time worked well for the Pats. Pettis and Taylor will create matchup difficulties for defenses lacking more than one slot CB. We have a post Foster plan. When we consider the fact that the 49ers haven’t scored a TD in the Return game since 2011 when Ted Ginn Jr. had a 39 yrd punt returned for a TD, it makes perfect sense to me that the team needed to greatly address this area. Also, in Pettis, we may have the best Punt Returner in 2018. Receiving will be situational and I see him getting some snaps in his rookie year – but his value will come in the return game where he may have a chance to be a pro-bowl player this season. Pettis will be fun to watch returning punts, that’s for sure. I keep visualizing Pettis getting major RAC after catching Jimmy’s well timed short passes. He could surprise with more snaps than expected. Maybe Foster gets traded for a pass rusher or CB. OAKLAND should be interested. Miami as well. I almost 100% agree grant. Just not sure if Derwin James would’ve been my pick. I also can see why the whole brown thing went down. They had questions about him. Last year of contract. Would’ve cost a lot next year. Mc flinchey is cheaper and probably will be decent. Just maybe not worthy of the 9th pick. But I couldve given them a pass on it and even given them praise for being anticipatory of the future. Only if the rest of the draft was not the worst thing I had seen since 2012. But everything else is spot on in your article. This one draft may not ruin the whole thing. The sky is not falling. But if they keep this pattern up year after year. It will be a 4-6 year run and done for these two. It’s unfortunate because I like them both and coaching has been much better than the recent pass. I hope McGlinchey doesn’t allow sacks because it would be tough walking around with the McFlinchy moniker (lol). 16 pressures out of 411 pass blocking snaps? I think he’ll be just fine in pass pro, especially as fast as Jimmy delivers the goods…. McGlinchey will be game changer. The only question for MM is will he be a Pro-Bowl player in his first year. It was a strange draft, is it bad, I sure cant tell. Lets just see what happens. I have no problems with the Glinch that stole the ninth pick. I think the biggest problem is the draft didn’t go where most people thought it would go. Yup as with all drafts, Woulda, Shoulda, Coulda done, got to get pass that, its over. Hope that pass rush is on the team. We may already (according to Lynch we do) have our EDGE on the team, but if not, Lynch we get one. If he could work a deal for Garoppolo, he can do the same for an EDGE. I’m confident that our first round pick will become a pro-bowler before any of the EDGE rushers selected in this draft. We’ll look back on this at the end of the season for a clearer view. Yup, its possible he is already on the team however I think its going to be more of a collective effort. The way I hope it goes is that the Niners offense gets on fire and stays on fire and the opposing team will have to pass to stay/catch up with, which will allow the D-line the ability to pin their ears back with little regard to the run. There still are two other big if’s on defense – Sherman and Foster. I wouldn’t count on either one of them till we can. I went into this draft with the hope that we could find 3-4 starters. We may have found 3 in McGlinchey, Warner and Pettis (as a Punt Return Specialist). We weren’t going to win a SB this year even if we had chosen the popular players touted on this board over the past few weeks. Regarding T.Brown, maybe there was a gentleman’s agreement with NE after the Jimmy G, trade. Kind of a “we owe you one” behind the scenes conversation. But likely it had more to do with Brown showing up out of shape last Monday. Shanahan said that he and Lynch decided last week that McGlinchey was their man. If true, the timing of their decision almost coincides with the time Brown showed up out of shape. Football is a full-time job, which means watching what you eat in the off season. When they traded up in second round. I was pumped to see a little aggressive gamesmanship from lynch and shanny. Jumping in front of Green Bay to get josh. Then my heart sank when they picked Pettis. Oh no they just got in front of us. Crap. The whole world knows they need a cb. There goes our guy!! Ok who’s next on our list? if they take Jackson we’ll take Oliver or vice verse. Wait what?! Hahaha. This was a real disappointment. 1. I agree with much of what Grant has been saying. In the first round we could have drafted a Probowler – Minkah, Edmunds or Derwin. 2. Had they improved D in the first, I would have been fine with making their Offense more dynamic in the second. They could have traded up just a few more spots for Courtland. They could have drafted a 200 carry talented RB – Chubb, Jones, Guice . They could have drafted one of the big red zone target TEs. But no, they drafted a 190 lb wimp. 3. After 3 minutes of research, I discovered that Pettis cant get off the line and a physical press corner will steal his lunch money after giving him an atomic wedgie. Furthermore his stats are skewed. He had big games against Fresno state and Oregon state. In fact 6 of his 7 receiving touchdowns were against these two defensive powerhouses. 4. Moving up in the 2nd in hopes of Punt return glory is idiotic. There is a talent disparity in college. In the NFL all of the special teams coverage corners, safeties and LBs are fast and quick. I dont seen Pettis amounting to anything special in special teams. 5. The rest of the draft was a hope a pray situation. Hope guys can learn a new position. Pray guys can return from injury. It’s difficult at times to give the Org positive critique when we see the draft from our lens, but sometimes we need to trust the professionals on gathering their intel on players. Case in point, how many of us on here knew that Landry was having issues with his knees and back? The news regarding Landry’ health issue centered around his ankle the past weeks until we heard differently over the weekend. The first 3-4 players drafted should have an earnest possibility to start in their 1st season. I think we will see that this year with a chance that McGlinchey and Pettis even making a bid for the pro-bowl. Warner will get plenty of work in rookie year and could become a starter by the game 8. The other draft picks and UDFA are (imo) peripheral players who could give minimal contributions and maybe we get a couple of surprises this year like Colbert and Breida from 2017. Many look at this draft as the glass half empty, but I see it half full and in keeping Lynch and Shanahan’ 3-4 year rebuild plan. OH…woe is me…they didn’t pick the one I wanted…maybe OAKLAND got him…! !…what am I doing on this blog ? Special teams is one third of the game, and can be the difference between winning and losing. Pettis had 9 PR TDs in college. That is a record, and I hope to see more. Drafting Pettis is building for the future. Now they can run 4 receiver sets. They can flood a zone, and JG just needs to throw to the open man. Now they can rotate receivers to keep their legs fresh. Pettis is a huge upgrade in the PR department. 9 PR TDs is very impressive. It is even a record. Bourne may be the odd man out. How about a real corner? DJ Reed. You gave the pick an A. It was not a Freudian slip. Why did the Niners pick Taylor? His ACL has healed and he played one whole season healthy. I think he is the eventual replacement for Mitchell. I will question their pick of Street, because he is an ACL injured player, and cannot help the team this season. DJ Reed is small, but if he can mirror the receiver, it will help the pass rush. He also is a willing tackler, and seems good against the run. Moore and Reed are insurance for Sherman. James is the 7th round pick, so he is a long shot no matter what. He is a scout pick. How will the Niners sack the QB? Armstead is healthy, and Marsh will have another year in the system. Attaochu sat behind Ingram and Bosa, so he does have talent. Solomon Thomas will have full participation in the OTAs, and he has another year in the same system. Saleh will now know what he has, so he can put them in their positions of strength. The overall depth is deeper so he can rotate constantly, and keep them fresh. Saleh has a year’s worth of experience being a DC. There is continuity. Has the defense gotten better? Yes, with several extensions and FA signings. There were 6 players taken from the third to sixth rounds on defense. Sure, no edge, but the coaches determined that the existing players were good enough, so they drafted other positions of need or depth. How can they win 8 games? It was important to draft McGlinchey to protect JG, but also run the Outside Zone. It was important to draft Pettis to improve the PR /ST aspect of the game. They drafted for need last season, and several players exceeded expectations. They are building upon that. They have continuity, so less turnover and turmoil. KS is assembling the team he wants. It took a couple years to get the Falcon offense humming, so this second year will have incremental improvements. With Jimmie Jesus Garoppolo, they finally have a franchise QB that can make the players around him better. Heck, JG helps make the defense better. His sustained drives allow the defense to rest. JG is bringing that winning culture to the Niners. JL drafted all high character guys this year. I predict 9 wins. If the planets align, they might get to 10 wins and a shot at the playoffs. I give this total draft an A-. Excluding JG, this current crop rates a B. So many questions, all answered. If it weren’t for Jimmy we’d be in big trouble. Nonetheless we have improved, albeit more on the offensive side. It’ll be an interesting year. Actually, it’s what Grant sees that others don’t. Sauron has nothing on Grant–Grant’s that big flaming eye on the tower. Sees and knows all. Grant’s grade isn’t that different from most of those actually. He gave it a C+ which a few others did too along with a few B’s. The Grades ultimately don’t matter but there has to be something to talk about rather than taking a wait and see approach. I’m starting to agree with Grant’ C+ but I’m adding a TBD caveat. The Niners only hope now? Fire Lynch and Shanny and hire Grant. Not sure they could get his big head through the door. PFF says “Above Average.” Sky is not falling. I agree with a lot of what Grant said. I’m fine with Mt. McGlinchey. He should improve the running game a lot. Brown was good in pass pro but not very good in the run game which is essential to Shanahan’s offense. So I do think this is an upgrade and disagree with the article on this point. However, Oliver or Jackson would have improved the team more than Pettis. And more importantly they would provide a plug and play boundary corner in the event that Sherman doesn’t return to form (which can’t be known until you see him running and cutting against receivers). Pettis is a good player who I expect to beat out Taylor before moving over to Garcon’s spot in a few years if he can put on some muscle. However, we basically drafted a punt returner with a number 2 pick who might slightly upgrade the slot. The weird part was that they doubled down on the slot by selecting Richie James. The team has 3 slot corners, Given their explanation of needing to find guys that have a chance to play where does Richie James play… why not invest in a player that might give you something at a position of need? Or, if not that an attribute the team doesn’t have like a big red zone target. Some speculate that they will start running more 4 wide receiver sets with 2 slots. But that doesn’t make sense to me given the investments they made at fullback and replacing Brown (a great pass blocker) with a better run blocker. The other questionable picks as grant stated were Kentavius Street (ACL) and Jullian Taylor (ACL) who both project best to Big End… so that means the niners have Thomas, Armstead, Blair, Carradine, Street and Taylor who project to the same position. Given the reasoning for not taking an edge rusher, these selections are also really strange to me. The biggest issue is that it seems the team lacked a clear plan. Best Player available would have made sense, filling needs would have made sense, but in this case it seems they did a little bit of everything and it ended up with a scattershot result. All complaints aside, if they end up with 3 starters and a competent role player or 2 out of the draft it will have to be considered a success. Why doesn’t that make sense given the investments at the slot position? Perhaps they are building the offense to suit JG as others have mentioned. As you can see, NE carries two slot WRs, with a third on the PS. Now we have Pettis and Taylor with James likely headed to the PS. Garoppolo is comfortable having two slot WRs. He excels at passes over the middle. Shanny liked to put Jones and Sanu in the slot. KS also talked shop with Belichick, he probably learned new stuff from the wise old man. It would make sense for KS to adopt some stuff from BB, especially since he has his former QB. WRT the investment at FB, Juice can play slot too. Same with McKinnon. If Shanahan is suddenly going to change his offense and start running 4 wr sets why keep the most expensive fullback in the game on the roster when he will seldom be on the field? Why get rid of one of the best pass protecting right tackles in the game, to draft a right tackle who’s better suited for run blocking? Wouldn’t you want someone better suited to protecting Jimmy if the offense is going to be running more 4 wr sets? Seems kinda bass ackwards. As to “the investment at FB, Juice can play slot too. Same with McKinnon.” comment, how is that supposed to make this move better? There is a limited number of slot receivers that can be on the field at one time, having 6 players that do the same thing seems like a waste of roster spaces, unless they are Julio Jones types, who can do anything. I understand flexibility, so I understood wanting Juice and McKinnon because they allow the team to change from a run to a pass formation and vise versa. But when they are on the field, the second slot receiver wont be. As to the Practice squad comment, do we really have enough talent that we should be picking practice squad guys and not looking for future starters? He did it for RGIII. But I’m not suggesting that they will be running four wide all the time, or even half the time. Juice wouldn’t seldom be on the field in my hypothetical scenario. They would run 4 wide occasionally on obvious passing downs, and here and there throughout the season. JG has a quick release. And again, my 4 WR scenario isn’t going to be the base offense. Why pass at all after losing Brown? Juice and Jet are versatile, like Pettis, this is one reason we drafted him. Pettis can do everything according to KS, same with Jet and Juice. Nobody is going to get 100% of the snaps except for JG and the OL. It was the last pick. Shoup I couldn’t agree more. That was my point in the previous topic thread. There didn’t seem to be a coherent strategy here. The explanations after the fact also didn’t make any sense. I know the apologists are going to say there was nobody better than the guy they took, but to not even address the biggest need positions at all is poor judgement imo. I didn’t like their explanations either. I think they got too cute trying to appease the fans. They should have kept it short and sweet with something like, we looked at a lot of guys throughout the draft, but it didn’t work out for one reason or another. Also, there’s a reason for coach speak. Shanny didn’t want to throw his edge rushers under the bus. Marsh appreciated this. edit – remove Carradine from my big end. Okay. Done. Be sure to keep the incision clean and take over the counter pain meds if needed. On your way out, check with the receptionist and make an appointment to come back in two weeks. I actually prefer Brian Peacock’s shadow draft. These are his previous shadow drafts. The Niners could have had Derwin James, Isaiah Oliver and Dorance Armstrong with three of their first four picks. I would have been good with that or with McGlinchey, Oliver, Warner and Armstrong. n see York firing Shanby and Lynch if they pull another draft like this ever again. No doubt the worst draft in niners history. Other than the very average Mcglichey. The combined draft of miner players won’t see 100 plays all year. That is completely nacceptable. Take a look at much better rated players that were there when they were on the clock they passed oVer. Had multiple times passed on players when on the clock, that were of need that could help them now, and took some practice squad player that did nothing but put a smile on the teams picking behind the niners. Lynch and Shanny has a very good draft last year. They had a very bad draft this year. Even Balke had a good draft his first year. If these two guys get Balke itis. Here we are, 30 April, and some would characterize the 9er plight as a ‘russian driving/russian dashcam’ youtube video. Check’em out, there are many. Your last 3 paragraphs are gems!!!!! If Williams was such a bad pick, the 49ers would have drafted another running back. Instead, they drafted two slot receivers, two safeties and two return men. Grant, you was actually being nice when you gave them the C grade. I gave them a D. Over the past 2 drafts we could of had a nice draft haul but they reached and drafted injured players. If Williams was such a good pick, the 49ers would not have overpaid a career backup like Jerick McKinnon $30M over 4 years to be one of the feature backs in Shanahan’s offense. Those have different skill sets. McKinnon is a receiver. Williams didn’t catch passes at Utah. Joe Williams quit football in college. Lynch took him off the draft board because of it and Shanahan had to lobby Lynch and the Scouts to draft him. Williams showed up to training camp and didn’t have the urgency or desire to compete last year. Shanahan recently said, “I expect him to turn up his urgency this year. I’ve talked to him about that. He says he has. Looking forward to seeing it.” There is absolutely no evidence whatsoever Joe Williams has any chance to contribute this coming year. I’m not sure why you keep holding out hope this was a good pick but I like your positive attitude. The 49ers are giving him every opportunity to prove himself. “Lobby” is the wrong word. I think the 49ers are handling Joe Williams like they would any other 4th round investment. Give him a chance. Frankly, I don’t see Williams being in the NFL for very long. If he can’t be motivated as a rookie, how long do you think he will be motivated as a 3, 4, year player. Let’s just say he has a great year next year. How does he do the following year? The guy could be a never was or the next Marcus Dupree. Right now Williams is a bad pick. They almost cut him last year. Instead they IR him with a phantom injury. He got beat out by Breida and Mosert. I would not be surprised if he gets cut this off season. But, they didn’t cut him last year, because they want him, and they knew another team would pick him up. Grant, you’re not entirely off base. I found the 49ers draft to be confounding at times. However, Pettis is not simply a slot receiver, he’s versatile, just drafted earlier than warranted. McGlinchey is an upgrade over TB in this offense. And, redundancy aside, the 49ers draft certainly wasn’t devoid of talent. Boy, it sure was a strange draft, I’ll give you that. My way too early grade is a C+. I hope Im wrong because a C+ certainly isn’t good enough. Suggest you interview the author (he’s in the Bay Area?). Get his sense for the behaviors and motivations of fans who go nuts over the NFL draft. Nuts in the sense of draft expectations/outcomes, before anyone sets foot on a field–overly optimistic ‘we crushed it! !’ to ‘we totally blew it and we’re doomed!!’. You know, all those brilliant GMs and personnel evaluators among us. Thx for sharing that book review. Would love for Grant to interview the author and share it on this blog–Grant should have ample time to pull this together in May/June. Focus would NFL draft uphoria/hysteria–what underlies/drives fan reaction. Can see York firing Shanby and Lynch if they pull another draft like this ever again. No doubt the worst draft in niners history. Other than the very average Mcglichey. The combined draft of miner players won’t see 100 plays all year. That is completely nacceptable. Take a look at much better rated players that were there when they were on the clock they passed on. These were also players of need. What happened to needing a pass rusher, interior lineman, long armed six foot two or taller corner, or a red zone receiver threat??? None of these were addressed. And when they say the guys they had on their roster were better than players they could have drafted then why did none of their current pass rushers ever started for an NFL team. Because They are C+ players at best .. I say watch Lynch and Shanny next year and is they pull this BS again fire them… remember even Balke had one good draft his first year…. Yeah, at least give all the draft picks and UDFA’s a chance to step on the field and become total busts before firing Lynch and Shanahan. Trent Brown just wasn’t that good of a scheme fit, so I’m not as critical of the McGlinchey pick. With one year left on his contract it wasn’t worth keeping him around to see if he could ultimately supplant Staley at LT (in 1-2 years). We have 4 1st rounders on the OL, and a high quality second round C. Hopefully they can live up to their draft slots. I was surprised we didn’t pick up a RB. Yes Brieda played well, we signed Jerrick, and Joe Williams may have some potential, but they’re all smaller guys. I guess KJ is our big back between the tackles? I like the Warner pick as he provides depth and coverage ability. I could see him in Eric Reid’s hybrid LB/safety role. One of our biggest needs was another outside corner given Sherman’s age and injury. This draft class didn’t really have the measurables our system prefers, so we took a risk on Tarvarius Moore. Is he ready to go day 1 and above criticism, no. But neither was Witherspoon who was knocked for avoiding tackling in college. Hopefully Saleh can get him up to speed by week 8. He is a tremendous athlete and you can call him a reach, but if he had been invited to the combine he would have received 10x the attention. In the mean time, we have to hope Jimmy Ward can step up. WR and CB were weak spots for this team, so it’s good to see we’ll create some competition in camp. Yes, we have a “slot ” in Trent Taylor, but he has a very different skill set than Pettis. Trent has solid hands and is a reliable 3rd down target, but he’s no burner after the catch (4.63). Pettis is a different animal in space, and we’ll likely see him on reverses, screens, etc. Plus, injuries happen and I don’t want to have to watch Aldrick Robinson anymore. I’ll take the staff at their word that they simply didn’t see guys in the draft that could take Marsh’s spot. We’re still a few pieces away, but we can win 9 games this season. I do agree with your criticism of the numerous players drafted with injury concerns. Scratching my head on Street and Harris. There’s obviously a disconnect here as to how Grant and the other detractors see the roles of these draft picks. On the one hand the detractors see how poorly they match up or otherwise fit into the scheme of things so we have to assume that KS is just not really very good at utilizing his players’ talents. Sorry, but while I’m not an expert like Grant and the other critics, I think KS knows precisely how he intends to use the new talent and deserves the benefit of any doubt on the subject. As far as Trent Brown is concerned, he is this years vesion of Aaron Lynch. Speculate on his future performance all you want…he just plain ate himself out of a job and if the discipline of being in a contract year couldn’t keep him in shape, wait until someone has to sign him to a long term contract with guaranteed money. That’s what people said about Mike Shanahan at first. They should of taken any trade option, moved down in the draft got more picks and then drafted the OT from UCLA later in the first or Williams from Texas. Then with the extra picks still draft their WR they got and maybe we could of got a CB or LB with the extra picks. Even they said that Lynch while watching tape of MM, was really watch Nelson the G.
Who should be next up for 9er GM and HC? You’re a forward thinker, who’d be able to pull the 9ers of the sand bar? I don’t see what’s wrong with objective criticism. I don’t know how Street and Harris fit. They provide big ends to back up… Armstead, Thomas and Blair… Ok i guess the niners can use them as insurance for Armstead when he leaves. There’s nothing wrong with it. Some fans just can’t take hearing anything negative said about the team. I experienced it a lot with criticism I directed toward Baalke, Tomsula, Kelly, Jed etc. You won’t get them to admit anything negative until that person is no longer with the team. It really is quite fascinating. There’s nothing wrong with it. I caught all kinds of crap for criticizing Chip Kelly. There is the homer aspect, they don’t won’t to hear it. But also, this is all open to interpretation. Some people legitimately see things differently than you. That’s fine and should be expected, I’m cool with being debated regarding my opinion. What I don’t like is simply saying stuff like ” there’s a reason you’re not in the league” or “ill trust Baalke, Lynch or Shanahan”. If they argue that this was the best pick their because of attributes he brings, that he was a better fit than the other options, or a perceived future need that’s reasonable. That’s what boards like this are all about. My concern with this draft was the fact they ignored their biggest needs in favor of players who add to the depth we already had. I don’t know how things will turn out, but I do know you can’t improve a position if you don’t select it. I guess I’ve got a little Odd Ball in me Rocket. Sometimes I just get a little too much of them negative waves. Love me some Clint Eastwood. This was probably one of my least favorite drafts I can remember. Which should also keep that in perspective for many of us. There were a lot of Baalke drafts I loved, and we all know how that ended. I’m willing to trust the process, they’ve earned that so far. from my perspective, I give the Niners a C+ primarily because they neglected a real CB, a definite need for an edge pass rusher and the risk taken on the injured players……Jerry Jones was considering trading back into the 3rd round to take Dorrance Armstrong of Kansas, settling to keep his pick and still getting him. Niners passed on him, Jackson and Oliver. 8 teams before and 8 teams after the Niners passed on James as well. Maybe draft rooms weren’t as high on him as pundits. I don’t see any problem passing on those guys. James wasn’t going to be the pick because they have Tartt that they like. The two corners would not of started over Witherspoon or Sherman. Armstrong is another Eli Harold but worse. Fitzpatrick didn’t make sense either. They got good play from corbert. It’s very easy to sit back and say they should of taken this or that. We won’t fully know about this draft class for 3 years. Last years class was productive. We will see how this one does this year. Actually Lynch admitted the decision was tough between Drago and James. They were in negotiations with Tartt since February. James was only an option before the extension took place. Once they sealed the deal it was Mcglitchy all the way. I think they like Corbert a lot. As well as Bourne at Wr. They have shown a lot of confidence in these two players. You say we won’t fully know about this class for 3 years right after stating you know certain players wouldn’t fit or start. You can’t have it both ways. Derwin James is a much better prospect coming out than Tartt was and they could have moved Tartt to FS which he can also play. Witherspoon and Colbert showed promise but they certainly didn’t cement themselves as quality starters for the long term. They barely know what these guys are capable of. You don’t ignore talent because you have a starter already in place unless that starter is an all pro caliber player. That is why Shanahan’s comments after the fact really didn’t make sense. Tartt is a better player at this moment then James. I have seen what Tartt can do although limited time. He is better suited for a box safety just like James. Brown was on his way out. Didn’t fit there system and they were concerned about paying him BIG money when he lacked a work ethic. So they drafted his replacement. I would of been fine with drafting Derwin but I understand taking a quality tackle. Especially considering that they were not high on brown. I disagree but that’s irrelevant to the point. You can’t say Derwin James wouldn’t be better than Tarrt, a rookie CB wouldn’t start over Witherspoon and Armstrong is worse than Eli Harold and then immediately follow it up by saying we won’t know about the guys we have for 3 years. It’s a contradiction. You don’t know anymore about the guys we didn’t pick than the guys we did. They could cut Robinson I guess. I am not “Anti-Grant”, he is a columnist, much like his dad, who thrives on being a contrarian. It stirs people up, makes you want to read what they say next: Will they agree? Will they say something positive? We all take the bait, and it makes things interesting. BUT, I am glad that I am not the only one who caught the fact that he loved the Reed pick and pans it now. Grant, it is okay to change your mind… when the facts change. What facts have changed? Was it a reactionary post because they finally took a CB? I thought it was a questionable pick when they made it, I mean the guy is undersized, so I agree with Grant’s second take. About Brown, I feel like he wasn’t their guy, and he wasn’t showing the coaches what they needed to see in a long term player, so they took McGlinchey . Am I thrilled with the pick? No. I would have rather they trade back or take Fitzpatrick, a swiss army knife, who can play it all. But, it was clear that offense was the focus. I will trust in the new leadership, until given reason not to. Lets not get all doom and gloom up in here! Go Niners! I think I was trying too hard to be positive during the draft. Certainly on day 3 you were:)… But that’s when Trent Baalke snuck in the war room and locked John and Kyle out. Grant – Your mistake is you think you made a mistake but you didn’t. His main mistake is in thinking that Kolton Miller should have been picked by the 49ers. Haha! That’s an acceptable answer! Will be fun to see if a few good prospects come to the surface. Good info… I’ll check them out to see if their are any gems hidden. Having reviewed you post of 4/29/17 regarding “grades” of the 2017 draft, perhaps you should learn to defer to administration, coaches, and scouts of the 49ers. Admittedly you are entitled to your opinion but to give “grades” at this point is arrogant and ignorant. 1. Thomas, C The jury is still out, We’ll know more after this season. 1A. Foster, C- Again, we’ll see after this season. 2. Witherspoon, B- Turns out he possibly should be graded higher. 3. Beathard, F He’s back-up qb and has started. Grade totally wrong. 4. Williams, A+ Never played a down. Another wait and see but so far a complete bust. 5. Kittle, A Maybe you got one right. 6. Jones, B Another wait and see. 6.A Tamoepenu, D Another too soon to judge. 7. Colbert, D Apparently a diamond in the rough. Draft success is usually judged after two years or more, not the first day. The Niners from what I can tell will start Ward/Tartt or Tartt/Corbett at safety. They are trusting that Corbett develops and/or Ward can stay healthy and play safety or CB. Then they are trusting that Witherspoon with be starting at CB. So in the 2018 draft their was no better players than Ward, Corbett or Witherspoon that they could of drafted? Then they have Eli who is just average and is in the last year of his contract. They drafted Fred and have Smith coming back. Who knows what will happen with Foster. The LB should be ok but no pass rush from this group. They their is the DL. They drafted no pass rush help because they think they have better players or are just hoping that some players develop. Pass rush is a very important part and they have not had a good pass rusher since Aldon. Thomas will not get you pass rush, Arik will not either and Buckner would get sacks if he had any help. I don’t really see any upgrade on defense. Sherman will be better than the CB we had last year starting but he will not be the same player. Hopefully Smith can return but he might of lost a step. Then what happens if Foster is out. We had bad pass defense and no pass rush but did not address either one. Sherman and Attaochu are slight improvements. It would take Thomas to have a big second year, Arik develops and does not get injured again, Sherman come back at least 80% healthy, Witherspoon develops a big step further, Corbett develops a big step further, Ward stays healthy and plays a safety position or CB. Then Foster does not get suspended or gets injured again. That’s why to many what ifs on defense. its not going to be great that we score lots of points but we can’t stop the other team from scoring more points. Fosters court date postponed until May 8th. The DA requested extra time to review the tape they have had for over a month. Seems to me that they have a very weak case. I expect these charges to get dropped and they then turn there attention to the victim who lied on the police report. If Foster is in the clear that is MASSIVE news. We will know more in the upcoming days. Grant – Doesn’t this go against your theory that the DA already had all the evidence before deciding to proceed with charges? DA didn’t know about tape until a week ago, according to reports. So the story is that the wounds the police officers saw were already there when the girlfriend arrived at Foster’s? HMMM – Apparently the police saw them but Foster didn’t (or he would have told the cops that fact) The DA doesn’t need any more time to “review” the tape. He needs to try to make sense out of this story which smells like fish left out in the sun too long. It means that it’s not going to be a lay up like the DA initially alluded to. That’s what Barrows reported initially. You don’t know what you are talking about. This so-called column is an absolute embarrassment. I can easily tear down this article bit by bit, but nothing epitomizes how badly done this article is more than the fact Grant is hating on the D.J. Reed pick after giving it an A during the draft. Perhaps Grant was on a sugar high during the draft. Too many pop tarts? Nah. I think he downed a family size bag of Sour Skittles before writing this article in order to get in the right mood. What amuses me even more is how many readers take his “analyses” seriously and addresses his ridiculous comments often at some detail…. And yet you read me every day. I actually come to your column several times each day when I take a break — it’s like the water-cooler. I’ve been doing that since Maiocco’s days when this blog was born, IIRC. However, I must confess that I rarely ever read your columns linked from the blog but I do a quick scan of your blog comments. But I do enjoy the way you bait fans into getting rile up or rise up in support. Make no mistake, I greatly appreciate your moxie the way you interact with the fans and dive right into the discussions and controversies. Of course, I wish I could actually learn something about the Niners and about football from your comments. But I am not complaining, just enjoying ! Hard to learn without reading. I’d love to learn insights about the Niners FO’s thought process on personnel, and insights on coaching by reading your columns. Perhaps with film analyses. However, by your own description, you see yourself as an opinion writer. Unfortunately, that’s one area for which I have little use. I read the contributors and avoid you like the plague. 2. How many 5-9 CBs are successful in the NFL? Lots, but all of them are slot corners. He’s the same height as K’Waun Williams. What’s the average height of slot CBs? This from a guy who predicted 9-7 last year with a backup Qb! I never could figure out the obsession with mock drafts and the bitter disappointment following the actual draft. However, there is one “mock draft” in which I’d definitely be interested. That draft would be today based on players that were available at the time the Niners made their picks (after the trade-ups or trade-downs). That would make more sense and it would be a worthwhile exercise to compare those mock draft classes with the actual draft class in 3 years. My main gripe is we clearly over reached in the first couple rounds. If you read between the lines and the comments by KS and JL, I sense a small power struggle at least pertaining to the roster. I hate to admit I agree with most of Grants post. Other than being gifted JG, these guys have made nothing but questionable decisions beginning with going into last season with Hoyer and CBJ as our top two qbs. By not giving Kaep a chance to compete vs two guys he’s vastly more talented than, it cleared the way for the rest of nfl to follow suit imo. I thought Shanahan–good/bad/indifferent–was quite clear last summer regarding Kaep’s poor fit within the system he was working to install. Yes maam I remember that and thought it was a weak defense, how do you know if a guy is a fit or not if you never give him a shot and instead go with Hoyer. The line of thinking was generic and proven to be so as we proceeded to go 0-10, saved only by the Pats generosity. And what’s with all the Baalke bashing, where were the naysayers when he we winning nfl gm of the year. But I’m sure that was mostly due to Scot Mac rt? Fact is he and our current GM are handicapped by paraage and the cheap skate York family. And please don’t point to recent JG contract, they essentially had no choice to sign him or the entire fan base woulda walked…..figuratively speaking of course. Was only pointing out Shanahan’s line–wasn’t attributing great value to it one way or the other. Shanahan is the paid architect of the 9er offense, and I would imagine he has a keen sense for personnel fits. If things are as fundamentally bad as many have concluded, Shanahan will be tossed aside by mid-December. Any recommendations for his replacement? I betcha Grant has a candidate in mind….himself. Grant, I am in full agreement with you. First, fans should always have an objective view of their teams. I’m tired of the “in Lynch we trust”. Don’t be sheep. I heard the same nonsense with Baalke for too many years. Every year, we should look at our team with an objective eye. Last year, Lynch killed it. Great draft. This year, we shall see, but looks a bit pedestrian. We added good talent, but we didn’t get markedly better because they didn’t fill pre-existing needs. As I have repeatedly stated, we created the need for our first round pick. There was no reason to think that we couldn’t get another year out of Brown, assess his value, and potentially drive up his trade value. Moreover, if protecting Garoppolo is #1 goal, then we just got worse on the right side. Can’t even argue that. McGlinchey is a) rookie b) pass protection is weakest part of his game. In a good OT year, he is a mid-first to second-round pick. We passed on 3-4 players who have All-Pro potential. Pettis, great pick, wrong spot. Period. Warner, best pick we made. Moore, 3rd round projection pick. I am less concerned with some of the rest. When you get in the 4-7 rds, it’s all a guessing game. This is why arm chair GM’s should not be allowed to express over the internet. Some of you should take note. Somebody is gonna get a little knock on the door by the Men In Black. Are you serious? You think we shouldn’t be able to give opinions because some nut job makes death threats? Rocket are you feeling guilty? I said “some of you” This nut job in this article is the type of fan I’m talking about. If you equate yourself to him then you should not be allowed to express yourself over the internet. And after reading some of the posts after the draft, there are definitely some quaks here. But in no shape or form would I say any of you who have normal football opinions, not kill the GM opinions, be silenced. It’s all opinion, until the nut jobs show up. You referenced armchair GM’s which is why I asked the question. There are messed up people in all walks of life and yet we don’t censor citizens in general. This is no different. Ok, so your saying it’s ok to threaten a gm because of a draft? Censorship my azz. That’s just plain stupid for anyone to do. Some people take freedom of speech to the max. And when they say dumb stuff on the internet that’s the 1st thing they bring up. Freedom of speech. In my opinion a person should be held accountable for using freedom of speech to threaten lives. People hide behind laws when they can’t be their true selves in public. No. I’m saying you can’t decide to censor unless you are prepared to do it universally. The guy who threatened Licht should be dealt with but it doesn’t mean you stop the entire process. Isn’t it freedom of speech? No one should take note. Even insinuating anyone here would threaten our GM, is pathetic and weak on your part. Everyone has a right to express their opinion on the draft. Period. The fact is, no one will know until years from now, whether we did well. That’s doesn’t mean GC, myself, anyone can’t share their views on it. Of course, nobody–not us, not Grant the Arrogant, not even Lynch and Shanny–know at this point whether they drafted the right players or not. We’ll know more as the year progresses, but it might three years before we can really judge it. You’ve ripped Lynch time and time again…same for Shanahan. Let’s expand a bit. How do you feel about those in the player personnel business who support Lynch? You know–Adam Peters, Vice President of Player Personnel, Martin Mayhew, Senior Personnel Executive, and all those scouts. What role have they played in our draft debacles? Complicit? Are they fools, duds, hacks, toadies (not the band…)? Or? Do you still feel the 9ers should have traded Garoppolo–as you promoted a few months ago? I see some people questioning whether it is ok to criticise the 49ers draft. Of course it is. Everyone is entitled to their opinion. Everyone has their own belief as to who the best picks would have been at certain spots. And this draft has left itself open to criticism as there are some clear areas of weakness on the team that remain big question marks. I know I am not enamoured with this draft, and definitely would have taken different players were I in charge. However, it is also worth keeping in mind that your opinion on best picks at certain points are just that – your opinion. And everyone here is a hack. And it is clearly not an opinion shared by the 49ers. Is this me saying we should shut up and accept what the 49ers do because they are the professionals? Not at all! NFL teams get it wrong all the time. But then so do draft analysts, and so do journalists and fans. Maybe Derwin James was the better pick then McGlinchey… or maybe he wasn’t. In 2-3 years time it really won’t matter whether James is a better player than McGlinchey. What will matter is whether the 49ers got a good OT in McGlinchey. That’s all that matters. Did you get good players? And I guarantee that some of these players the 49ers drafted won’t be. I also guarantee you some of the players anyone here thinks they should have drafted also won’t be good players. As for missing out on an edge guy. I understand this is a real sore point for many. I know it annoys me. But here’s the thing – it was a weak class. After they missed out on one early they were in serious bother. A guy like Armstrong was not likely to save them. As a comparison, I assure you players like Eli Harold and Jerry Attaochu came into this league with much higher draft grades from NFL teams. That’s why they were taken earlier than Armstrong in years that had better edge talent. They are both still young. So saying Armstrong (or any of the day 3 guys) would be better than what they have is, quite frankly, conjecture without much basis right now. Call the above an apology if you like. But its just an ugly truth about this edge class. I am sure there will be guys taken late that end up being decent, maybe some guys that end up being good, but very hard to ID who that will be, and if we all knew who it would be they would have been taken early. Drafting an edge guy for the sake of adding someone is not a good long term strategy if it means passing over a player at another position you like more. I’m curious why it annoys you. I am asking this because you appear to have recognized the obvious answer. Niners did not value any of the pass rushers (Landry, Davenport, etc.) worthy of being picked in the first and top-half of second rounds, compared to the talent they have currently. You also acknowledge that fans make opinions with small amount of information (IMO, in a group-think atmosphere within an echo chamber of a bunch of draftnik journalists and youtube highlight videos). It annoys me because I see it as an obvious weakness on the team. I want the team to have a better edge rush. I wish they had been able to find a guy they liked early. I am not annoyed that they passed on lesser talent. Scoot… My thing with this is when you said you would have taken different players if you were in charge. But I would say, if you were in charge, looked at your team, studied your team, went through the whole draft process with the combine, interviews, and prodays, and listened to all the scouts and your right hand men in the personnel department, would you really have e made different picks? See it’s easy for us to sit here and say that they made mistakes when the only “tape” we see is YouTube and college boards. So your opinion is correct saying you would have chosen different guys, but if you were actually in John and Kyle’s place, would you have? I am 100% certain if I was in charge I would have made different picks. Different people see different things. 32 teams have 32 different draft boards. But while I am sure I would have made different picks I am not going to sit here and tell you right now my picks would have been better. And I’m not saying your picks would have been wrong. But I am saying, they see their team and their schemes and their philosophy much different than other teams. I’m not saying the picks they made were great, but I learned a long time ago, just because YouTube says player A is great, their interview and background, and tape could have put player A off the board or behind player B. And when I look at this team I will say I”understand” every pick. Especially when it comes to scheme. John and Kyle weren’t the only people picking players in the draft. The players some of us would have drafted instead WERE drafted by other teams. That is why I never understand this inability of some of you to accept the idea that the decisions made by this team are not always the right ones. I’m not saying I know better, I don’t, I’m simply pointing out that there were other options at areas of need that teams other than the Niners valued. 10 pass rushers and 10 interior OL went in the first 3 rounds. Obviously there were a lot of teams that didn’t agree with the Niners on the quality of the positions. That’s true, but of those 10 olineman the niners must have felt they got the best one left on their board. And must of felt those others couldn’t beat out what they had. Or felt when it was their turn to pick, the player they chose was better. But only the niners can tell you that. But it doesn’t matter because you won’t believe the explanation anyhow. I’ve already heard the explanation Steelematic. Shanahan came out and said in no uncertain terms that it would be hard for them to find somebody who could beat out who they had already and to me that is a load of crap. The Niners may have the worst group of edge players in the league. They were the worst pass rushing team last year and didn’t really do much of anything to improve it. You may think that makes sense, but I don’t. “the niners may have the worst edge rushers in the league”. So your idea is to draft guys that aren’t better than these guys and hope for the best? Rocket, I never say they always make the right choices. 32 NFL team’s are in this league and I’m 100 percent sure they all fail. What I don’t understand is why alot of people on here criticize to the point like they know better than the front office. If 90 percent of you were in charge I’m pretty sure Harold Landry would have been the 1st choice and all of you would have felt so good about it. And no matter the criticism you would have felt you made the right choice. Even in 3 years, if he was out of there league. I have learned to understand where teams are coming from with their team schemes and philosophy. It’s also why I enjoy the process of the unknown, until in September when the boots hit the ground. Then we will officially see the results. The response I get when I criticize the team for not taking a pass rusher or a G is that I don’t know anything (I never said I did), it was a weak class and that the team knows better. My counter point to that is that there are many other teams in this league that disagreed with the idea of their not being good options at these positions. So it is not outside the realm of possibility that trusting in the team may not be correct in this case and maybe, just maybe, they screwed up in not addressing the biggest needs they had. That’s why I mentioned philosophy when we talked yesterday. That wasn’t directed at you #80. I don’t mind disagreement but the “you aren’t on an NFL team so you aren’t qualified to comment” stuff gets old. That’s such a lazy and weak response and offers nothing to the discussion. Absolutely agree it gets old. When people say “you aren’t on an NFL team so you aren’t qualified to comment”, they really mean, ‘I don’t have a counterpoint, so shut up’. ..why you would bet a rookie edge rusher drafted in the rd 2-7 of this draft will beat out the vets currently on the team is whatz confusing…. To be fair oneniner, they would only need to get something like 4 sacks to be an improvement. That’s hardly a major ask. No question, everyone should feel free to disagree with any decision 49er executive management makes. Holy crap after reading your post I don’t see how you didn’t give the 49ers an F-. I will wait 2 years to grade this class. I really like McGlinchey, Pettis, Warner, Moore, Street and Reed but will wait until I see them on the field before I give them a grade. Whether I like them post draft or you dislike them post draft is equally meaningless until we see them compete against NFL competition. I tend not to comment on the success/failure of Drafts because I have no information about why the players picked by my favorite team were potentially valued differently than the pundits/NFL hype machine (always more interested in clicks than anything else). My very favorite result of this draft though is it seems to have given Grant heartburn. I give this draft an A grade. Two scoops for you! Excellent! Niners pick up Armsteads 5th year option. Smart move. Too much talent to let walk. He stays healthy he breaks out this year. Wow – Buried in all of this noise is an actual piece of news. Thank you for this. Wow, did not see that one coming. Hope he has a healthy and dominant year. Its a good move, IF he can stay healthy. Last year the Niners were 5th in pass pressure till he was injured and they dropped to 12th. This move will be immediately used by Grant and other fans to attack FO for stockpiling excessive numbers of D linemen. However, if one studies the Super Bowl champs, then rotated their linemen constantly so that none of them exceeded 600 snaps during the regular season. I think the Niners want to be be in that position in order to make a run for the play offs this season. They were acquiring guys off the street last year due to injuries so some depth is a good thing. Nice in theory but both have extensive injury issues and one won’t play this year. I also question the link to the Eagles. Sure they rotated DL and they had some good ones. Most teams do rotate DL and keep approx. the same amount active on game day. The difference is the Eagles had good backups and many teams don’t. It’s not a trend or a strategy unless you have the bodies to do it. Both NE and many of the other teams in the SB the past few years did it differently. It always comes down to talent. In Maiocco’s recent interview with Ian Williams, the latter mentioned that he expects a big year from Arik. Williams was mildly critical of fans saying they do not know or understand that players play below potential when injured and make all kinds of thoughtless pronouncements on social media. I heard that Landry dropped on the draft boards of NFL teams not just because of his “medical issues”, because many teams estimate that he is not going to get much stronger (which he needs to in order to be effective against NFL pass blockers). Looking at the fate of the players I actually watched in multiple college games, all but one went lower than I had estimated. Justin Reid (FS): thought he’d go in second. Picked in third. Reason: Versatility (played all 5 positions) seen as a shortcoming? Meeks (CB): thought he’d go in 5th or 6th. Went undrafted. Reason: Lacks speed and fluidity? Harrison Phillips (DT): thought he’d go in late second or early third. Picked late third: Reason: Lack of gap discipline? Dalton Schultz (TE): Thought he’d be picked in third or fourth rounds. Went in third to Cowboys with a chance to succeed Witten. Great opportunity. Allen Lazard (WR): thought he’d go in 4th or 5th : Went undrafted. Reason: Lacks speed? Conclusion: Excessive familiarity bias led to “overdrafting” by overlooking NFL’s need for speed and strength. Back to pre-K scouting academy for remedial coursework. Tricky sometimes to evaluate college speed, since criteria needs to be reset game tape to game tape according to opponents’ speed/ability. A four catch game against top talent may show more than an eight catch, 2 TD game against lesser talent. Picking up Armstead’s option makes some of the picks even more redundant. No doubt this draft was weird, I suppose time will tell the tale. Hard to understand the picks of Street and Taylor if they are happy with Armstead. I expect Taylor will be competing with Blair for a spot this year (basically taking Douzable’s spot). But still no need for two of them playing the same spot effectively if Armstead is going to be around for two more years. There’s our Edge prospect. Hope he pans out. Just like Pita, who seems to have been forgotten on here by everyone, TomD and a few others mentioned Pita this past weekend. Kudos to the Pita guys. Yes, I’m thinking Pita will make a good case for sticking in 2018–barring injury. Agreed. He’s had a year to bulk up. He showed flashes last preseason. I’m excited to see him this year. I follow the Pac12. Saw some of his games, one in person. He’s got good potential. Oops. Scott is a DT. The high amount of sacks fooled me. Bad job #80. He did play DE as a freshman though. It must be a real bummer to be Cohn Jr.
It’s also a lot easier to predict doom and gloom. Only one team can win the Super Bowl. The rest of the teams are all losers. The new regime will produce a winning franchise once again to Niner fans.